The Peak of the Elk Rut! People text or email me often and ask when the best time to elk hunt is. Is it best to hunt the week of the peak of the rut? Which, incidentally, will always be the fall equinox around the 21st of September. The biologist that I interviewed was adamant about that. The peak of the rut means that is when they are usually the noisiest, because that is when the most cows are in estrus. People often say things like, "The rut has already peaked, because it got quiet". Or, "There is no peak this year. I'm not hearing much." Regardless of weather, wolves, pressure or anything else that might make them quiet down, "the rut" WILL take place. They will mate and the peak of the rut is still on. You just might not always hear it. For more information check out our page on the Elk Rut. You might find that a full moon causes the elk to shut up and go to bedding areas earlier the next morning. They do seem to be more active feeding when the moon is bright all day long. A densely clouded sky can blunt that effect. That just means you might have a shorter morning of daylight action. But, remember to be there near bedding areas around 10:00 to 2:00 in order to work those elk that move around to feed, rut and drink! We have the new camo products that ASAT has developed. The new and improved G2 Essential Pant made with the ultra-quiet microtex material will quickly prove itself not only comfortable and easy to move in with the new athletic cut and articulated leg seams, but it will be a favorite in your hunting arsenal for warm weather spot-and-stalk. It has vents in the gusset of the pant to keep you cool in those early fall hunts and remains versatile with cargo pockets on the legs for your accessories. In addition, the lotus nano barrier will assist in keeping you dry by repelling water during those dewy early mornings walking to the stand or sitting through light early season rains. 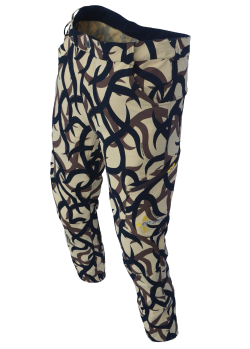 The new Knarr pants are lightweight, breathable, durable and water repellent. Only high quality YKK zippers are used. The fabric blend is a strong four-way stretch material. They have an athletic fit with an extra cuff length tucked under for the taller person's inseam adjustment, if needed. The seems are 33" and are expandable to 36" by very simply removing the double cuff stitching. This is high demand time for ASAT, so expect some sizes to temporarily go out of stock. ASAT Rain Gear suits have been hard to find for quite some time! They are available again!